Late evening December 31st 1959 as No. 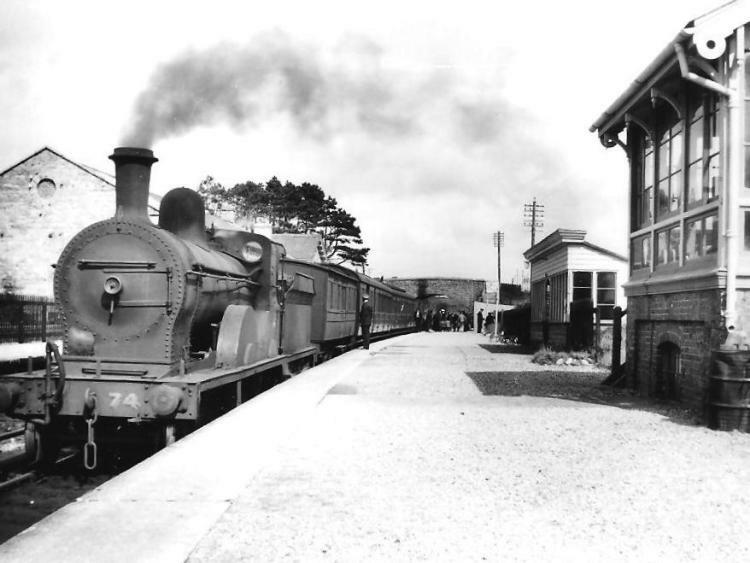 4 Meenglass locomotive and carriages with passengers on board pulled out of Donegal Town rail station it signalled the end of an era of rail which lasted for 96 years in the county. Ballyshannon G.N.R. station in 1956 one year before closure. Passengers are being checked in the background by Irish Customs. Buildings on right include waiting shelter and signal cabin. The County Donegal Railways developed a 125 mile narrow gauge system which connected with Strabane station to become the largest narrow gauge system in Ireland and the British Isles. The original Strabane to Stranorlar Finn Valley Railway opened the county hub in September 1863, built at a cost of £70,000, employing 650 labourers to lay the tracks. By the end of 1880, then named the West Donegal Railway, the Stranorlar to DonegalTown tracks were being laid passing between the Barnesmore twin mountains of Croagh Conal and Croagh Eoin, but due to lack of funds only finishing at Druminin Halt in 1882. This meant a horse and trap ride at six pence per head for passengers ongoing to DonegalTown. However the line finally reached its proposed destination on 16th September 1889 and onto Killybegs in 1893. The County Donegal Railways (CDR) were formed in 1892 and the DonegalTown to Ballyshannon branch line followed in 1905. There were plans to extend this line to Kilcar, Carrick and Teelin Pier which never came to fruition. The 24 mile track from Stranorlar to Fintown, Glenties laid in 1895, initially a five foot three inch guage, later changed to narrow gauge three foot. Sadly passenger services on this line were closed in 1947, freight train service of cattle, sheep, turf closed in March 1952. The Railways of Donegal from the CDR to Letterkenny’s Lough Swilly line and the Great Northern Rail which serviced from Northern Ireland to last stop Ballyshannon have filled the pages of many books. Many evenings, as children we played around the Donegal station, stood and dreamed as we watched tears of sadness between parents and young emigrants boarding the yellow and dark red carriages on their journeys to a new world and hopefully new lives for some. There were many individual characters involved with the CDR,among these, Driver Joe Thompson, Guard Tommy McCafferty both who refused to discontinue services on the 31st December 1959 and ran a ghost train Donegal to Ballyshannon for weeks after the official closure. In his final years Joe worked in the goods shed and had daily contact with us in the Post Office mails section. Over its years the CDR had a good safety record. Their only serious accident occurred at the HospitalBridgeDonegalTown when a goods train and rail car collided head on. The rail car driver James McIntyre and two passengers Mrs Rebecca Fawcett Ballinamallard and Mrs Mary Stevenson Donegal Town were killed, with many other passengers injured. My grandmother, then a nurse in DonegalHospital, often told us the story where the crash took place immediately below her home, the old stone workhouse master’s home, which still stands to this day. She climbed down the embankment and rescued two young Ballyshannon brothers, the McIntyres, who were thrown from the rail car onto the a section of the train, with very little wounds. Apparently one of the brothers later joined the priesthood and regularly came back to visit her. Eason’s even had a newspaper book stall at the station. Jack McMullin with his trusty helper Jim Weir, ran a horse drawn goods service from track to town businesses. In early 1960 all tracks were speedily removed and generations were left to ‘weep for the wee Donegal’ as its locomotives,coaches and wagons were left to rot and vandalised at Strabane rail station until 1973. Luckily a preservation movement saved some, other stock were beyond repair. In 1995 the Donegal Railway Heritage Centre was opened in the old station house DonegalTown and is a successful visitor attraction and CDR information centre.